We’ve been playing around with the Amazon Fire Kids Edition tablet and it is such perfect timing for the summer months when my kids are out of school! Amazon has recently come out with a new line up of Fire tablets for kids, and this one is full of fun and education and entertainment. It comes preloaded with 1-year of FreeTime Unlimited on each tablet, which offers access to pre-selected kids programming and entertainment, including 15,000 popular apps and games, videos, books, and educational content from the top programming you know and love. Check out my full review of the tablet below! 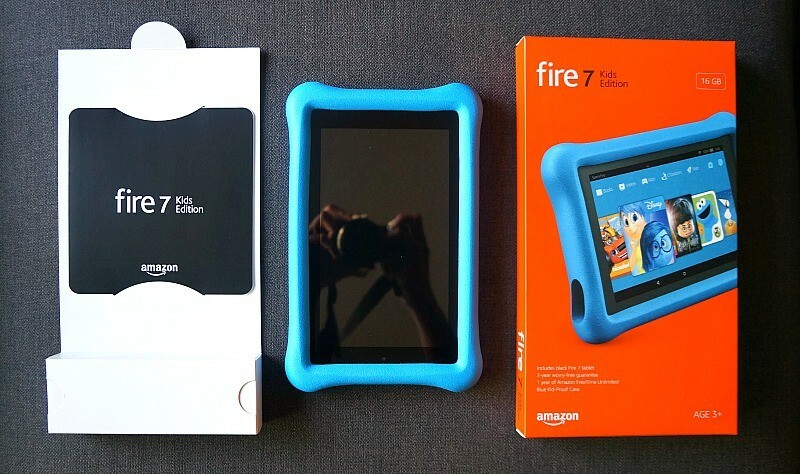 In addition to its kid-proof casing and user friendly interface made just for kids, I do have to say that the parental controls on the Amazon Fire 7 Kids Edition are the top sell for me. With other tablets and devices having complete and unfiltered access to the internet, there’s so much out there that I don’t think my kids really need to be exposed to. 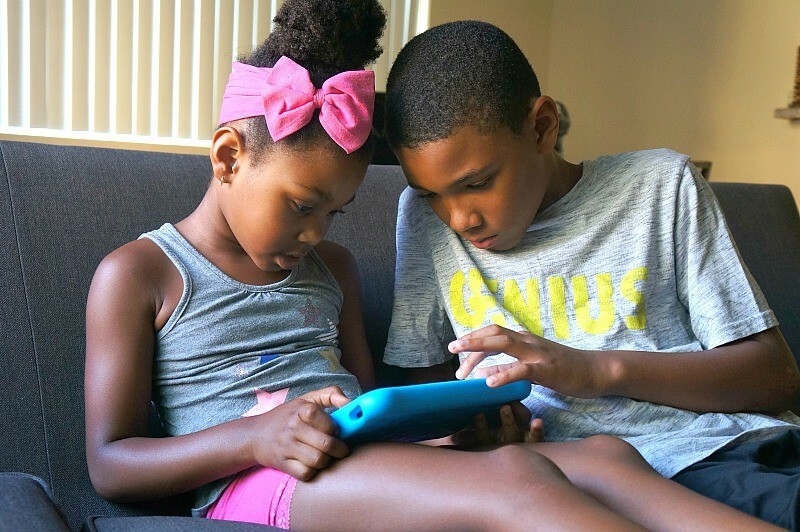 Having a kids tablet with parental controls provides peace of mind and ensures that they are watching, learning, and playing the appropriate videos and games for their age group. 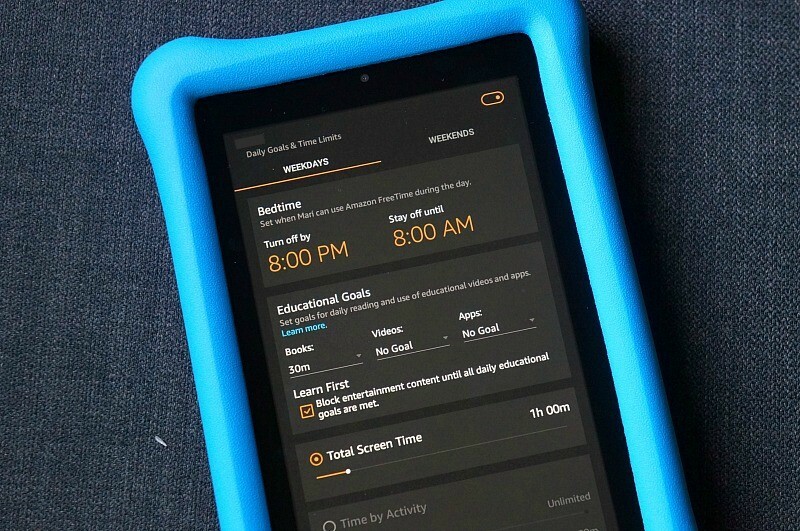 The Amazon Fire Kids Edition tablet offers parental controls that I have not seen elsewhere. 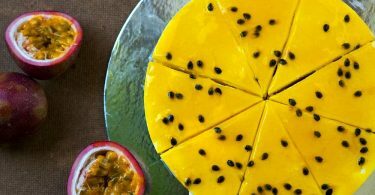 This gives total control to parents of what their children access on apps, games, videos, and web pages, all controlled in the Amazon parent dashboard. There are lots of super fun TV shows, games, videos, and other apps already on the Fire tablet. My kids watch their favorite Disney, Nickelodeon, and PBS Kids episodes, and I don’t know about your kids, but mine love all of these channels! 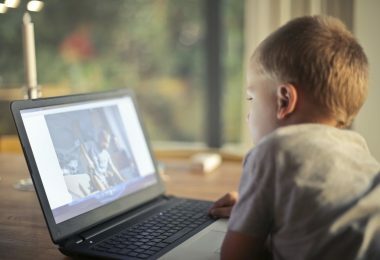 The kid-safe web browser does not allow full internet access, but has over 56,000 child friendly websites, videos, and YouTube videos curated from experts in the field. Add any other websites you want, it’s totally up to you! There is a section in the parent dashboard that allows you to set goals and limits for each child as you see fit. Select stars and end times, disable the games by setting educational goals until they complete them, and even choose the amount of screen time you want your kids to have per activity, and per day. Every kids tablet with parental controls does not have these features, so I am glad that the Amazon Fire Kids Tablet does! 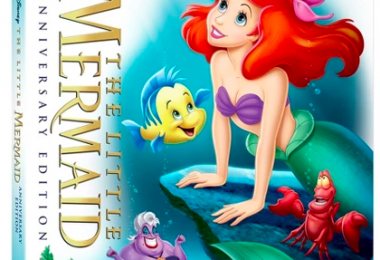 Smart Filters allows parents to curate a child’s entertainment experience easily. I really like this feature because you can set up separate profiles for each child in your family to ensure they are getting the best age appropriate entertainment for them. At any time, you can add additional apps, videos, and games, and remove the ones you don’t want them using. My daughter is six years-old and would be totally bored with toddler programming, so I set the content age range from 5 – 7 years old. My son is a little older and mature, so I allow him to use the teen profile (which gives a little more access) and I chose to add YouTube, Netflix, and other apps to his account. 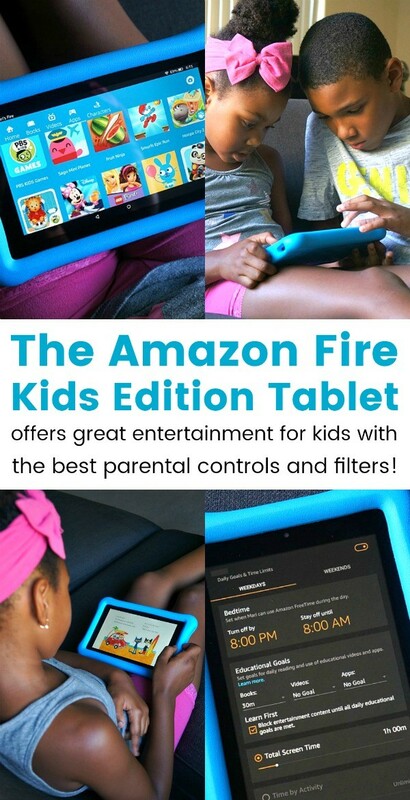 The Amazon Fire Kids Edition tablet features all of the programs that kids love with the parental controls needed to offer peace of mind for moms like me! 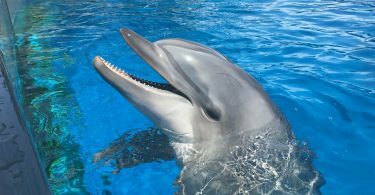 I am a big fan; it is a great way to provide educational content and entertain my kids without worrying about what they’re seeing or how much screen time they’re getting. This is an awesome kids tablet with a 2-year warranty (Amazon will replace it absolutely free, no questions asked) and top parental controls; I highly recommend it to anyone who’s looking. Right now, you can take advantage of 20% off of the current price! Click here to redeem the 20% off promo code, and head over to Amazon to get your new Amazon Fire Kids Edition tablet! 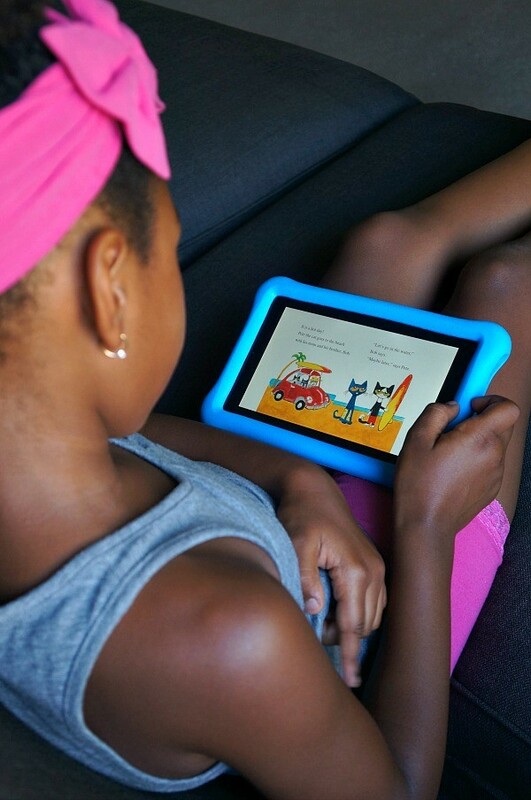 What do you love most about the Amazon Fire Kids Edition tablet? 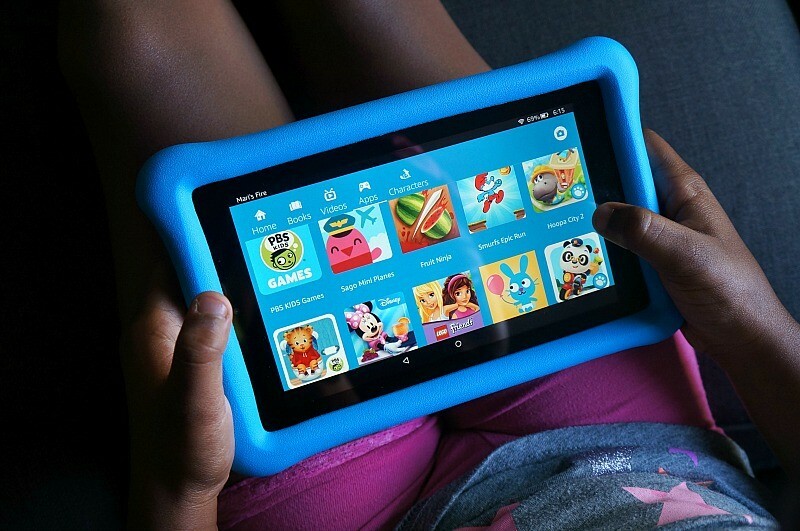 This Amazon Fire Kids tablet review is part of a paid Red Tricycle and Amazon Fire Kids Edition blogging program. The opinions and ideas expressed here are my own.